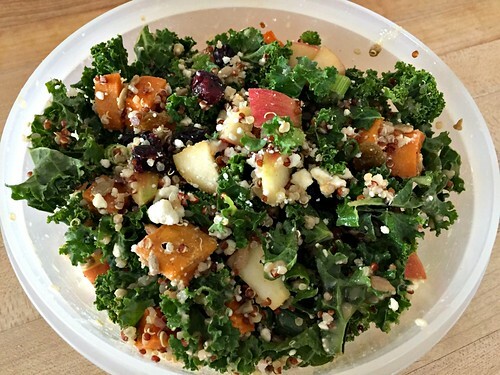 Loaded Kale Salad… One We Actually Want to Eat! Several years ago, when Dave and I first started ordering meals from Blue Apron, kale was one ingredient that periodically showed up in our meal boxes… and neither of us really enjoyed it all that much. Then about a year ago, right smack in the middle of my “eat as many veggies as I can” challenge, I got another bunch of kale in my Blue Apron box… and I decided I was going to figure out a way to eat it AND enjoy it! I did some “recipe research” on Pinterest and found a kale recipe that called for roasted sweet potatoes, cooked quinoa, and a smattering of other ingredients I already had in the pantry, in the fridge, and in the freezer. I decided to try this recipe (with a few tweaks, of course) and I made my own vinaigrette dressing. When I hesitantly served it as a side dish with our meal that night, I waited for Dave’s reaction… and was pleasantly surprised when he said he actually liked it! In fact, we both enjoyed the salad so much that I made it again the next day for my lunch. After making it a few more times, I realized that it actually tasted better if I let it marinate in the dressing for several hours before eating it — so I started making big batches of it to keep on hand for lunches throughout the week or a quick side dish to go along with dinner. Since then, I’ve made some variation of this salad on a weekly basis and thoroughly enjoy it every single time! If you’ve tried to like kale but just can’t, I would highly encourage you to give this recipe a try!! * I almost always have containers of cooked quinoa and roasted sweet potatoes in the fridge — so this salad takes mere minutes to throw together. If you don’t always have these foods ready to go, the recipe will take you a bit longer… but it’s worth it! Wash, dry, and chop kale, place into a large bowl. Cook quinoa according to package directions, let cool for a bit and add to kale. Peel, dice, and roast sweet potato (375º for 30 minutes). Cool and add to kale. 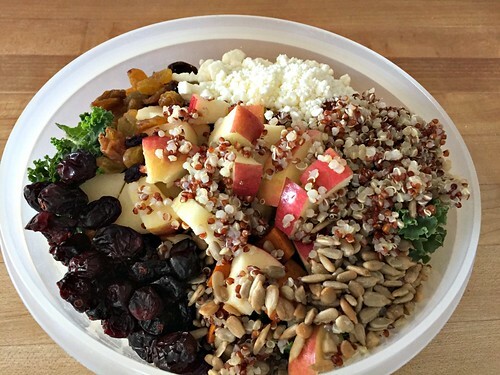 Add apple, onion, dried fruit, sunflower seeds, nuts and any other mix-ins you’d like. Mix well. Pour half the dressing over kale and mix well. Refrigerate until ready to eat. Pour remaining dressing over salad (if desired) when ready to eat. Store any leftovers in an air-tight food storage container. 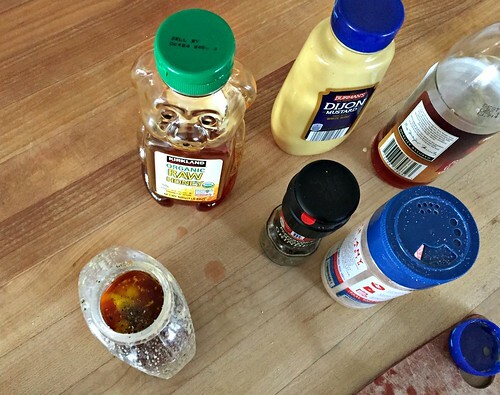 NOTE: I usually make a double or triple batch of the dressing and store in an extra dijon mustard bottle. Then, whenever I whip up another batch of this salad, I have the dressing ready to go. In case you still aren’t convinced this recipe is worth trying, let me point out that kale is an excellent source of iron (something I’ve always needed more of) as well as vitamins K, A, and C… and while I’m always in favor of vitamin-rich veggies and greens, the real benefit of kale (for me) is it’s shelf-life. I’m happy to report that I no longer throw my kale away! In fact, I will actually crave this salad, to the point where I’m bummed if we run out of kale before I’m ready to hit up the stores again! Do you have a kale recipe you actually enjoy? Easy Chocolate Covered Banana "Popsicles"
How I Stretch Our Groceries for 2-3 Weeks! Made this tonight, following the recipe exactly, and it was great. I don’t like Kale, but this was delicious. Thanks. oh good — so glad to hear this Sharon! My favorite way to eat kale is in Zuppa Toscana soup. For salads– i never tried one yet that i loved, same as with Brussels sprouts. I will try this recipe soon! I made this today and it was amazing! I had to substitute a few things (dried blueberries and goat cheese), but it was so tasty and filling. Thanks for the recipe! And yes, you can sub in so many different things, depending on what you have in the house! Wow! I really will have to try this. I love roasted veggies but for some reason salad or making a salad isn’t my favorite thing. 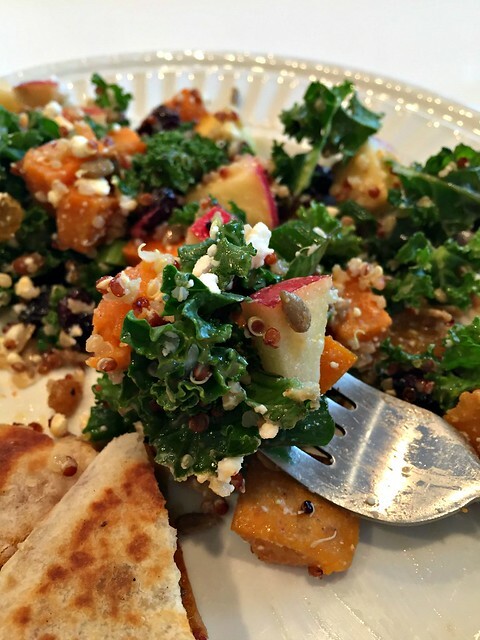 the roasted sweet potatoes REALLY give great flavor to this salad! This looks very similar to one I concocted. 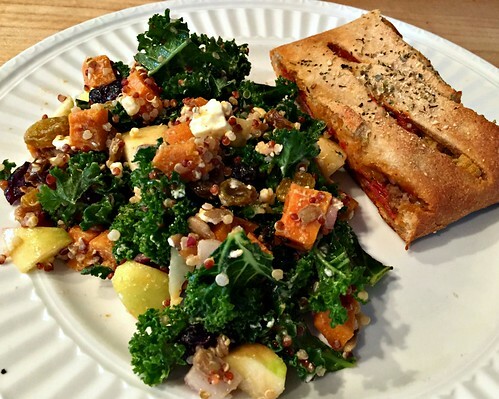 I LOVE the sweet potato/feta cheese combo and use it often in salads! I also make a very good kale salad with a simple lemon garlic vinaigrette with almonds and craisins. 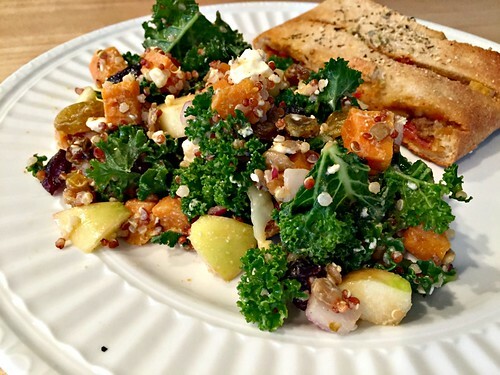 yes, the sweet potato + feta is fantastic!! My favorite kale recipe (and I’m not a fan of greens lol) is thinly sliced plums with a dressing made up of equal parts of honey, olive oil and vinagrette. I was amazed at how good it was. I think I tried with canned peaches also – but plums are the best. Also i think it makes a difference in the kind of kale you buy?? I’m just guessing – I know I have had some I liked better than others. well this is very interesting — I’ve never ever thought to combine kale with plums! 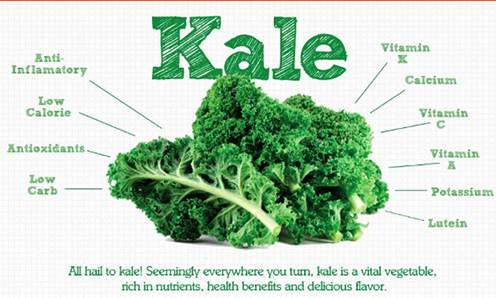 And yes, I’m sure there are many different types of kale. I’m not exactly sure what type I buy (it’s from Aldi) — but we like it! 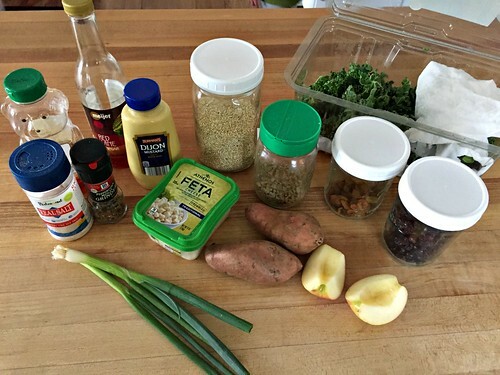 The perfect kale recipe—so many other ingredients I will hardly taste the kale! haha — yes exactly! 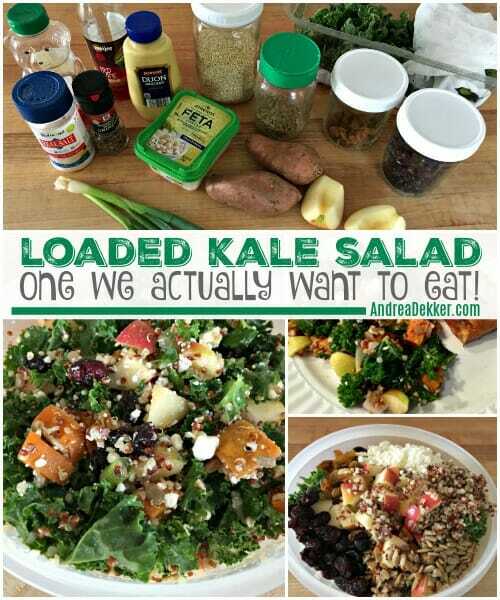 That’s why I call it the “loaded” kale salad! This looks so delicious, so happy you posted it! Heading out now to get the ingredients. What did you serve this with in the picture above? Thank you! the food pictured is stromboli — but we serve it with pasta, fish, soup and sandwiches, etc. it goes with everything! My first Blue Apron meal contained kale to be marinated and it was delicious. Before then I only had two other ways I knew to use it. This is a fantastic recipe for my weekly meal prep! Wow -this looks fantastic! Will definitely make it. Thanks for sharing. you’re welcome — it really IS delicious! A tip someone gave me a while ago that was a game changer was to put the salad dressing on the chopped kale and massage it with your hands. Like your trying to squash it. It breaks down the leaves, makes in less bitter and easier to eat. Then you add your toppings. I bet that what happens when it sits. Even after the massage it still lasts for ever and gets better. yes, I’ve read this too — or even just to massage the leaves with a little olive oil. And yes, that’s why I decided to try putting the dressing on early — it’s SO yummy! oh good, hope you like it!! Do you have any tips for cooking quinoa? I have eaten it as a sample at a grocery store and it was good but when I made it, it was disgusting. Chris, try rinsing it first and then cooking it in chicken broth. I actually use my rice cooker to cook it so I don’t have to “monitor the pot”! Kale entered greek grocery stores about 1-2 years ago and I never bought it because I didn’t know how to prepare it. I’d also heard stories of friends saying it tastes awful in salads so it never actually made it in my cart. But I think I will try your recipe as they hardly fail me! Last week I made your truffles (with some digestive cookies I wanted to get rid of) and the chicken with pesto recipe is in weekly rotation during summer since I got tons of fresh basil in my garden. yay, glad you found a use for your stale cookies — I have 2 tins of truffles in the freezer right now. YUM!! Hope you love the salad.